We all know when it’s coming. 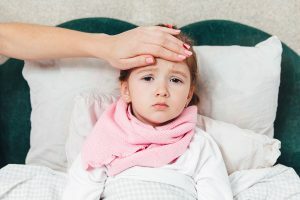 The whining starts, eyes glaze over, pink cheeks, cold hands or hot palms…the mush that is your kid with a fever. Baby, toddler, adolescent, or teenager (even adult children for that matter) all feel perfectly crappy with a fever. And as parents, we can easily panic. It’s just awful to see our usually bright, happy kiddo with the energy of a damp sponge. – Always keep ibuprofen and/or Tylenol on hand so you don’t find yourself half asleep at the pharmacy at 3 am. -Know your child’s dose. Especially under 2 years of age, ask your pediatrician at each visit what meds are appropriate and dosages. Text it to yourself!! Over 2 years of age, follow label directions. -For a kid who loathes liquid meds, ask your pediatrician about other options such as chewables for older ones and…dare I suggest it, rectal suppositories for younger ones. -Don’t overdress your feverish kid. Likewise, no ice baths or alcohol baths! These are old unproven remedies that can do more harm than good. -Lukewarm towel on the forehead or back of the neck is ok.
-Ibuprofen and acetaminophen typically bring the temperature down by 1 or 2 degrees only. It’s ok! It’s not necessary to bring your child’s temperature down to 98.6. As long as they’re comfortable, they can hang out at a higher than normal temp. -Encourage plenty of fluids! Fever can lead to dehydration, so fill up a big water bottle and keep offering it. -Most kids with fever should be seen by their pediatrician to determine the illness causing the fever. -Any fever > 105 F in any age. -Any child acting listless, very fussy, unusually drowsy. -Fever when accompanied by a seizure. -Fever with severe symptoms of a headache, abdominal pain, throat/ear pain, stiff neck, unexplained rash. -Fever with signs of dehydration such as a sunken soft spot, dry mouth, significantly fewer wet diapers, inability to take in liquids, or severe vomiting and diarrhea. -Any fever in a child with a weakened immune system. Fear not the next time a fever makes its way into your home! Fever know-how, a couple good books, a cozy spot on the couch and an ice pop can go a long way to keeping everyone a little more comfortable!